Wanted to add a couple of comments about the Shippensburg show. First, I was so happy when my friend siclayfan got a call out from Clay. The whole thing was really cute. I haven't seen any mention of Clay laughing at the one guy when he was doing his man schtick. One of the men in the front row said he was there with his wife and her girlfriend, and the girlfriend was sitting between them, which led to some funny Clay comments. Then when Clay was singing What Are You Doing New Year's Eve and was in front of this group, the guy reached his arm across the back of the girlfriend and that cracked Clay up. I think the friend was embarrassed but the wife thought it was hysterical. Also when we were leaving, one of the women ushers just started talking to me and my friend about how great Clay was. I think she started off by saying Wow, and then went on to say how personable and funny he was on top of singing so well. She really seemed impressed. I also noticed that Clay seemed to have some trouble in the beginning, and he looked like he was kind of swallowing hard or something. Once he came back out and made the comments about coughing up a piece of coal, he seemed to do better. And about the cameras, this was the most direct I've ever heard him be about allowing cameras. He came right out and said it was fine. It was funny that a whole bunch of people reached in to bags for their cameras after that, just wish all of them had listened about the no flash. I think canfly has the whole show and she had a great seat. Not sure how long it will take for her to get it up because she has really slow internet. There should also be audio if I did it right. She gave me her recorder to use so hopefully that came out ok too. Even though I live only about 30 minutes from Shippensburg, I've never been there but I was really impressed with the campus and with the Luhr Center. It was a really nice venue and they really did a good job of making it look all festive for Christmas. Home from the Boston Clay Aiken show and I can literally say it was the best show EVER! Clay sang beautifully! He was so on. Our tickets said Row 4, but the venue was set up as little tables so we were like front row center and I mean RIGHT in front of the stage! The mic stand was right in front of me. We could have reached out and touched Clay's shoes! THAT CLOSE! It was amazing and I am SO grateful to Kimberley Dorman and Suzanne Gustafson for taking me with them, and for Christina Dorman for letting me go in her place! It was to date the best night of my life! ? I hadn't watched a whole lot of clack, but I knew the set list and had listened to a few cellcerts. Still, the opening to "All Is Well" with the tape player was hilarious. The faces he makes! cindilu2 was concerned at first, thinking something really was wrong, until she realized it was just schtick, and he had us all laughing. And then he started singing and we were all blown away. There were a few rough patches, enough to make us grab on to each other and cross our fingers, but of course he nailed it and almost blew the roof off with the final note. The overwhelming feeling I got during the show was that he was loving it, he was enjoying himself up there, and he was selling himself to a lot of people who he knew had never seen him before. It was much less of a show "for us" than the Tried & True tour was. This was a show designed to wow, and it certainly did. I think he really, really wants to keep doing this, and I am sure he will. I am not worried anymore that this might be the last tour. This man was born to be on stage. He glows, and he is so funny and comfortable in his own skin now. God, I was blown away by the power of his voice and the control he has over it. In one song, he can go soft and delicate, and then the next line practically take the roof off. At one point he raved about the acoustics in the venue, and dropped the mike and sang a line or two of MCWL just to demonstrate how his voice could carry right to the back. Which it did. I'd love to hear him sing a whole song that way. A couple of times I had to force myself to keep my eyes open. No, not because I was bored. OMG, who could be bored with that man on stage and those gorgeous sounds coming out of his mouth? I am just such an audiofile, and his voice is just such a perfect instrument, I sometimes want to close my eyes to focus even more on it. But of course, that would be sacriledge! I can't even describe how great of a concert it was. Every time you think there is no way he could possibly raise the bar higher, and every time he manages to do it. Had I not known I had tickets to two more shows, I would have been devastated when he started into "Don't Save It All For Christmas Day" because it was almost over. But thankfully, I do have tickets, and come ice storm or blizzard, I'll get to both of them. It was kind of ironic that it became a bit of the Faye show, given that certain members of our group aren't her biggest fans. Hee. But it was also kind of cool that it took the banter in different directions, and gave us a gorgeous example of how well Clay can harmonize. The girl Faye had picked to go up on stage and sing Silver Bells was very, very good, but Clay just amazes me with his ability to figure a harmony out so quickly. He sang the first line of the melody to get her started, then went down to harmonize with her, then decided to go up and sing the high part instead. It was so cool! And the freaking toilet banter was hilarious. He was so tickled with that, I just love to see him so happy up there. I had perma grin all night and still do even this morning, although I've had little sleep and my stomach is tied in knots because of not eating properly on the road. Oh well, the things we do for Clay Aiken, eh? I loved the overall package. Heh, the show people, the show! The stories lead perfectly into the songs. I had a bit of a hard time understanding Faye's story, but it was the quality of the recording more than her accent. I heard later that it might have been recorded over the phone, and that explains it. But his banter about the pig tail later was hilarious! Because they were my thoughts exactly. Who the hell wraps up a pig tail? LOL! I look forward to downloading the clack and reliving every minute of this show. His voice was fantastic. A few cracks but he reigned them in every time. And I really hope someone was kind enough to get a full body shot during "Don't Save It All For Christmas Day". The man sings with his feet too, people! I love the way he gets his whole body into it. That was the best rendition of "Don't Save It All For Christmas Day" I've ever heard him sing. And then he came out on our side for the encore, and sat on the edge of the stage right in front of us. I hadn't spoiled myself at all for this song, not even audio, so it was totally new to me. I couldn't tell you the first thing thing about it though, because I think I was in the Aiken fog. He walked up our aisle, but no one touched him. God he just commands the audience these days. He is so in his element. When we were leaving, even the ushers were commenting to us on how amazing he is. There were some local couples standing outside, and we heard them say "he has a very loyal following". So we chatted with them a little bit, let them know where we were from, etc. And then we all jumped in the car because we were freaking starving, and headed over to a 24 hour diner across the road from our hotel. It quickly got busy with other Clay fans coming in, including fellow Ontarian canfly172, and justclay12, amongst others whose names I don't remember. It was fun to be able to decompress and relive and eeeeee and squeeeeee for a while. Then we fell into bed and got up early to begin the trek home and do it all over again next weekend! I wasn't going to do a real recap of Shppensburg but I have been reading others and thought I would offer a few comments since I found myself nodding in agreement with so many others. It really was evident that it was a crowd of ALOT of guys and "other people." Even from convos behind me I could tell. People wondering what he would sing. This was truly the most guys I ever saw at a show. The stories fit the show perfectly. It likely gets lost on a cellcert. I don't listen to them because I think it really does not represent a show at all. Its a nice variety in the show of songs and comedy. Clay was really funny. Voice trouble. Again, I doubt you can really hear that on a cellcert. You can hear it live. He had trouble and did talk about it. Voice changing. Swallowed coal. He was reaching for alot of notes. Often that comes off as yelling. But, I have to say that alot of it was really great. I love the medlies. The soft, effortless singing. First Noel finale with the horns was just awesome. He commented on the venue acoustics. He put down the mike at one point. He probably didn't even need it at all. There was a mention of Silver Bells harmony. Well I think it was pretty easy for Clay since his recording of it is heard every day on the radio at Christmas these days. The woman that sang with him was really good to sing it off the cuff with him. The venue. Gorgeous stage decoration. The musicians looked beautiful there with Ben on piano. Loved it. And the people working there were lovely. Friendly and very nice. Easy parking and enter and exit. The orchestra was incredible and Clay said so. Better than many he has heard. Friends. Well it was great to spend time with jasr and mr jasr and DD. We had dinner at the Shippen Hotel with them and our other gala friends. Very nice. On another personal note, the JNT was very emotional for me. I realized how much I missed it. I remember the first one when the green sweater spoke to me and Ilovemycat in the first row. (Missed you girl). He was wearing the same pants as that day. The long beige plaid ones. MCWL and Emmanuel made me cry. I loved those days when Clay had a huge ad in the NY Times for Madison Square Garden. Good to know the JNT is back. I probably forgot something. Will add if I remember. But I think the recaps have been right on the money. A beautiful night in Shippensburg made it feel even more like Christmas. A little late but here is my Shippensburg recap. First of all want to give a huge THANK YOU to misschris and her lovely DH for hosting us and getting us to and from the concert. I was in AC last week and what a difference in the crowd. They were very appreciative and enthusiastic, which was nice as there were a bunch of first timers. We were alot closer to the stage this time which is always a good thing LOL as I got to see his expressions alot more clearly. He looked fantastic although I do think the shiny suit needs to be retired, makes him look boxy or something. Anyhow the acoustics were so much better than AC and were great for his voice. What I have noticed with this tour is that his hands are interpreting the song as much as his voice. I found his voice to be just as smooth as AC, oerhaps got a little tired towards the end but still superb. For me the highlights are definitely the Away in a Manger medley, his voice and the arrangement are just exquisite. All Year Long is beautiful and I actually could hear it this week. EEE for DD#1 who was in the row in front of us but opposite end of the aisle as he came out that side. She was thrilled. He is so freaking funny and quick when working the audience. I definitely left wanting more, don't we always? One of these years I hope to be able to do a tour from start to finish, definitely on my bucket list. So thankful for the cellcerts and clack to keep it going for me. Today I sent a quick email to the Luhrs Center to let them know how much I enjoyed the show and how others on a fan board (did not mention by name) had commented on what a beautiful venue it was and how friendly and helpful the staff was. I received this reply within the hour. that your sons are alumni of the university too. We hope that you have a Great Holiday Season! 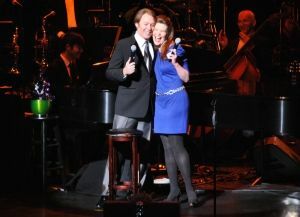 Clay Aiken and Sarah Timm from Sight and Sound Theaters share a hug after performing “Sleigh Ride” together. Clay Aiken and the orchestra performing at the Luhrs Center. Clay Aiken sitting onstage singing the final song. 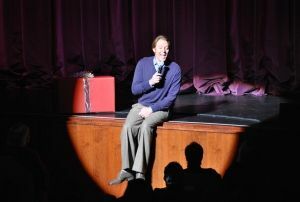 Clay Aiken’s performance at the Luhrs Center Saturday was a show to remember right from the opening number. As the lights faded out and a spotlight was brought up on the curtains, Aiken walked on stage to the beat of applause and began to sing his opening song, “All is Well;” except that no music came out. Standing in silence with his hands clasped around the microphone, Aiken looked side to side to see if someone was fixing the issue. After two to three minutes, he finally walked off stage as the audience burst into laughter at the unexpected situation. Re-emerging with a new microphone, Aiken laughed with the crowd and began again; this time with full sound and a booming voice. The curtains rose, revealing a full orchestra with Christmas trees and presents aligning the stage. It was a genuine scene of Christmas celebration. When he finished his opening songs, Aiken approached the crowd and delivered jokes about Pennsylvania being the heart of America. He praised the energy of Northwestern fans, saying that Southern fans were usually quite reserved and respectful, but that he enjoys the crowd being excited. From there he led into his rendition of “O Holy Night” and a medley of other popular songs. He complimented the Luhrs Center on its beauty and noted that the acoustics of the theatre were doing wonders for his voice. “I’ve waited 35 years for this. There’s so much bass in my voice,” Aiken joked. Later in the show, he said that the Luhrs Center reminded him of his time on “American Idol” because the rooms looked similar, and the Luhrs Center had a similar sound to the area that Aiken used to practice in for the show. 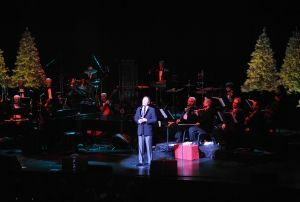 The most impromptu part of the show came when Aiken addressed his mother in the audience, who was in Lancaster the day before to see a performance at the Sight and Sound Theater. Aiken talked to his mom about the show, as if there weren’t 200 strangers surrounding them, and discussed a talented woman Aiken’s mom met at Sight and Sound. Aiken called Sarah Timm to the stage and asked her to play a game. She would pick a song title out of a bowl and try to remember the lyrics. Timm selected “Up On the Rooftop,” and proceeded to stun the crowd with her vocal ability. After a strong urging from his mother, Aiken asked Timm back to the stage to sing a duet. Flawlessly, the pair joined up and sang “Sleigh Ride” in perfect harmony, causing the audience to erupt in cheers and applause. After Timm left the stage, Aiken explained that the past two shows he has “lost complete control” of where the show was supposed to go. “I’ve lost control of the ship, no pun intended,” Aiken quipped. Getting the show back on schedule, Aiken spent the rest of the show praising his orchestra, chatting with audience members and picking out specific people to talk to. He then turned the crowd’s attention to his drummer, who has a challenging last name: Joe Choroszewski. Throughout the show, Aiken made it feel more like a gathering of friends than a performance with strangers. He singled out the male audience members and a few women sitting in the front row; his humor never faltering throughout the show. In a more personal, intimate ending, Aiken reminisced that 10 years ago this week was his time on “American Idol” and the first time he met his fellow competitor Ruben Studdard, who would go on to win the show that season. Aiken continued to thank his fans for all that they’ve done. “I thank you for allowing me to do this for the past ten years,” Aiken said to his dedicated fans, known as “Claymates.” He went on to say that he is thankful for the kindness and compassion his fans continually show not only to himself, but to fellow fans and others. He closed with some inspirational words and encouragement to continually be kind to one another and faded into his last song, “Don’t Save It All For Christmas Day.” It was this perfect ending that earned the singer a standing ovation. When the applause died down, Aiken returned for the encore just like the show had started: a single spotlight on him in front of closed curtains, and nothing more, as he sat and sang to the audience in Luhrs. He worked his way up the aisle and finished by exiting out the side door, leaving everyone to feel like the Christmas spirit had arrived. Clay Aiken has had a busy 10 years with tours, albums, a role on Broadway and his work with the charity UNICEF. Throughout those 10 years, one thing has remained consistent: Aiken remains a talented and kind person who genuinely loves what he does. Saturday night was no exception. Powered by SMF 2.0 RC3 | SMF © 2006–2010, Simple Machines LLC Page created in 0.072 seconds with 24 queries.